Degenerative joint disease is the most common form of arthritis. The condition is marked by progressive destruction of the articular cartilage which is easily documented by standard X-ray studies. The regeneration of this articular cartilage in clinical practice has been difficult. Five knees with articular cartilage degeneration were treated with Prolotherapy in this report. Each of the five knees showed improvement of their standard clinical X-rays after the Prolotherapy, signifying articular cartilage repair with Prolotherapy. It is suggested that before and after X-ray studies can be used to document the response of degenerated joints to Prolotherapy. Osteoarthritis is the most common form of knee arthritis and can involve any or all three compartments in the knee: the medial compartment (medial tibial plateau and medial femoral condyle); the lateral compartment (lateral tibial plateau and lateral femoral condyle); or the patellofemoral compartment (patella and femoral trochlear notch). This report documents the results in five degenerated knees treated with Prolotherapy. 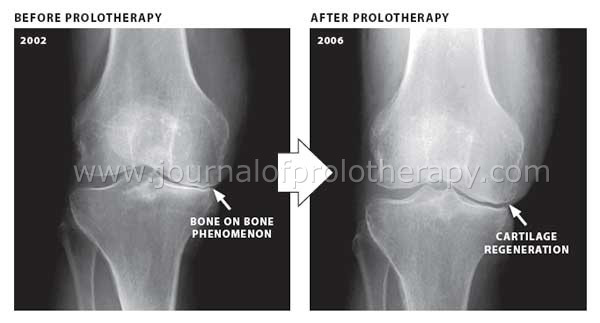 Before and after X-rays were available to document articular cartilage regeneration with Prolotherapy. Three patients representing five degenerated knees underwent Prolotherapy at the private practice of the primary author at Caring Medical and Rehabilitation Services in Oak Park, Illinois. Each patient underwent standard Hackett-Hemwall Prolotherapy to the knee.23 Each patient had the following areas injected: intraarticular, pes anserine, medial collateral and lateral collateral ligament attachments, and medial side of the patella. The basic solution used was 15% dextrose and 10% Sarapin. Each joint received 2IU of Human Growth Hormone by injection. A total of 5 to 10cc of Prolotherapy solution was injected into the joint at each visit. Four hundred milligrams of glucosamine sulfate was added to one of the 10cc syringes. A total of 30 to 40cc of Prolotherapy solution was used per knee at each visit. This represented 20 to 30 injections per knee per visit. Case One: CW is a 72 year-old woman who presented in July 2004, complaining of a five-year history of severe right knee pain. She rated her knee pain on the visual analogue scale (VAS) at a level of 6 on a scale of 0 to 10. She experienced daily pain throughout the whole knee and noted that the severity of the pain was also increasing. Her other symptoms were increased pain upon sitting for long periods of time, difficulty with stairs, and increased pain with walking. She was not exercising. She had no previous history of trauma or knee surgery. Three previous hyaluronic acid treatments provided diminishing relief. She used the oral pain relievers, tramadol hydrochloride and acetaminophen, as needed. X-rays done in 2002 showed osteoarthritis, marked loss of joint space medially, subchondral sclerosis and osteophyte formation. CW was told by an orthopedist that she needed a total knee replacement. She read about Prolotherapy in an alternative medicine newsletter and wanted to try it instead of surgery. Physical examination showed normal knee alignment. Lachman, anterior drawer, valgus and varus stress tests were all negative. She exhibited joint line tenderness both medially and laterally, but worse medially, as well as quite a bit of crepitus in the knee throughout the range of motion. There was no swelling present in the knee. Her range of motion was 3 to 95 degrees. Prolotherapy treatments began in July 2004. CW received nine treatments on her right knee through May 2005. She reported an incremental decrease in pain and increased mobility as she was interviewed every four to six weeks during the course of treatment. Her range of motion had improved to full extension and flexion to 110 degrees. Her crepitus was nearly nonexistent. She reported at this time, “I am 97% better. I have no pain (VAS score 0), just mild stiffness that subsides with walking.” She was treated one more time and told to return to the clinic if the pain returned. She no longer needed medications or a total knee replacement. CW returned to the clinic in May 2006 because she twisted her knee and some of her pain returned. Her physical exam at that time was unchanged from when she was seen in May 2005, except she showed more medial joint line tenderness and tenderness at the pes anserine area. She received four more treatments over the next four months, making incremental improvements in her pain. At this time, the patient was doing great, yet desired to see “how my cartilage was doing.” The X-rays showed a large increase of medial joint space. (See Figure 1.) By this time, the patient had received 14 Prolotherapy treatments to her knee. Seventeen months after her last Prolotherapy treatment, the patient continues to have full function of the knee with almost no pain (0 to 1 on VAS). She has returned to full activities without pain and is on no pain medications. Figure 1. Standard weight bearing knee X-rays of C.W. before and after Prolotherapy. The widening of the medial joint space width indicates that cartilage regeneration has taken place. Case Two: JP is a 60 year-old female who was first seen in October 2005 complaining of a three year history of bilateral knee pain. She rated her right knee pain as 6 and her left knee as a 5 on the VAS. The pain in both knees occurred primarily in the medial area. Rising from a chair, taking the stairs, and simply walking caused pain. The patient tried using heat, ice, aspirin and ibuprofen to alleviate the pain. She tried to avoid allowing the pain to limit her activities, but she was now down to walking once or twice a week instead of daily. She could only stand for short periods of time now. She also noted that getting up from a low couch or stool was now “very difficult.” She felt the strength in her legs was rapidly diminishing. X-rays done in April 2005 by her primary care physician showed moderately severe osteoarthritic degenerative changes bilaterally, greatest in the medial compartments. She told her massage therapist about the X-ray and she recommended a Prolotherapy evaluation. Physical examination revealed full extension, but only 90 degrees of flexion. Tenderness with palpation at the medial joint line bilaterally was also noted. The patient was unsteady with a one-legged stand on either leg. Moderate clicking was noted in both knees. There was no evidence of swelling or joint instability. JP steadily improved with Prolotherapy treatments. When seen in September 2006, after eight Prolotherapy treatments on her right knee and six on her left, she reported an 85% reduction in pain in the right knee and 70% in the left. She now had some pain free days. She noticed the clicking in both knees was markedly less and was now able to climb stairs without any complaints. Her walking was uninhibited as long as it was slow without much pain. She felt she had poor balance if she walked fast. JP did great, but felt some stiffness with long periods of sitting, thus she came in for one more visit in May 2007. This was her eleventh Prolotherapy on her right knee and ninth on her left knee. Her walking was now completely pain free. Physical examination at that time showed that her bilateral knee flexion had increased to 100 degrees and the clicking had completely resolved. She requested repeat X-rays after that visit and they showed a significant improvement of the joint space width in both knees both medially and laterally. (See Figure 2.) Specifically the X-rays on both knees showed a joint space now present medially. When phoned six months after her last visit in 2007, she noted that both knee joints were gliding smoothly and were “not making any noises” according to the patient. She had no pain with walking or stairs. She was on no pain medications and felt she had absolutely no limitations in regard to her knees. Figure 2. 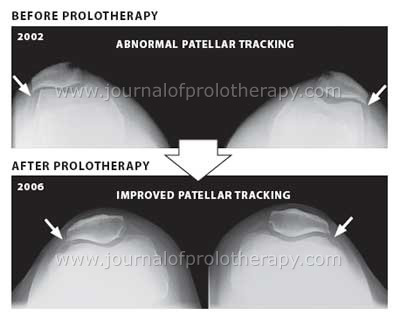 Standard weight bearing bilateral knee X-rays of J.P. before and after Prolotherapy. The widening of the medial joint space width in both knees indicates that cartilage regeneration has taken place. Case Three: JL is a 42 year-old female who came in with a ten year history of bilateral knee subluxations and diffuse knee pains. Her goal was to decrease pain with the hope of being able to play competitive tennis again. She complained of her knees “giving out,” along with having bilateral medial knee weakness, joint stiffness, and recurring edema with most leg exercises. The patient reported that the pain was making tennis playing impossible. She was being followed by an orthopedic physician because of her severe bilateral chondromalacia. He prescribed piroxicam 20mg daily and ordered her to discontinue tennis and lower extremity weight training for a minimum of eight weeks. He also ordered 10 weeks of physical therapy, which was of no help to the patient in reducing her pain. She rated her pain as a seven on the left knee and six on the right knee (VAS) 0 to 10. Physical exam revealed significant crepitation in knees bilaterally. The patellas were tracking laterally with excessive movement. Lachman, anterior drawer, valgus and varus stress tests were all negative. She had full knee extension, but flexion was limited to 90 degrees bilaterally. She found out about Prolotherapy through an internet search. Figure 3. Standard bilateral sunrise view knee X-rays of J.L. before and after Prolotherapy. These X-rays demonstrate J.L.’s chondromalacia patella and lateral patellar tracking are much improved with Prolotherapy. While JL made tremendous strides with Prolotherapy, unfortunately in the spring of 2008, because of her tremendous training schedule, to make an elite traveling tennis team, she developed new injuries and had to give up her spot on the team. A series of Prolotherapy treatments improved the X-ray findings in these five degenerated knees. Specifically, the joint space width (JSW) in these X-rays increased with Prolotherapy, signifying the regeneration of articular cartilage. The three patients also reported improvements in their pain and function with the Prolotherapy treatments. Articular cartilage degeneration is the hallmark of the osteoarthritis that affects 46 million Americans. It has a major impact on functioning and independence and is the leading cause of disability in the general population of the United States according to the Center for Disease Control (CDC).24 As the U.S. population ages, these numbers are likely to increase sharply. Among adults of working age (18 to 64 years), work limitations attributable to arthritis affects about one in 20 adults in the general population and one-third of those with arthritis.25 For example, the annual cost of OA per person living with OA is approximately $5,700, but the economic burden of disabling knee and hip osteoarthritis has an annual cost per person of almost $10,000.26,27 Needless to say efforts or treatments that could potentially reverse or stop the progression of OA would have a huge quality of life, as well as economic impact not only on individual patients but on health care costs overall. Figure 4. Measurement of joint space width in weight-bearing knee X-ray. A decreased Joint Space Width (JSW) indicates articular cartilage degeneration medially. X-rays were obtained in these five knees upon the request of the patients. It is not routine to order X-rays on patients with positive or curative results. These five knees suggest that standard clinical radiographs of the knee may prove beneficial in confirming the reason for the patients’ improvement with Prolotherapy. Cases one and two represent the most common form of knee OA, degeneration of the medial femorotibial joint. The improvement of the JSW in case one was 0.5mm. In case two, the right knee JSW increased by 0.4mm and the left by 0.3mm. Case three involved the regeneration of the patellofemoral joint. This person had chondromalacia patellae. Not only was there evidence of increase in the JSW laterally of 0.6mm bilaterally, but the tracking of the patella improved. All of this improvement came while the patients’ functions improved. All met their pretreatment goals except case three, JL, who did not get back to unlimited competitive tennis. One item not in her favor is her 5’4”, 200+ pound muscular frame. Previous attempts at cartilage regeneration have been numerous and mostly futile.42,43,44,45 While a number of very complex surgical techniques exist, they require extensive rehabilitation periods and tremendous expense. Prolotherapy, on the other hand, is a simple, cost effective, time-efficient alternative. Prolotherapy injections are an outpatient procedure, taking the clinician just minutes to perform. Patient activities are virtually unlimited during the course of Prolotherapy treatments with a gradual return to pre-injury exercise levels. While the potential is there for Prolotherapy to improve the quality of life of patients with degenerative knee arthritis and be a cost savings, future long-term controlled studies will be needed to assess this. To the age old question “Can adult articular cartilage cells be regenerated?” these five knees suggest the answer is “yes.” Each of the five post-Prolotherapy radiographs revealed an increase in joint space width which coincided with symptom relief and return of most function. This suggests in these five degenerated knees that Prolotherapy has the potential to reverse degenerative knee arthritis. Further research with a larger patient population and under a more controlled setting is needed to provide further evidence of cartilage regeneration and Prolotherapy. Prolotherapy improved the pain and function in five knees with osteoarthritis. All five degenerated knees showed evidence of articular cartilage regeneration in their standard weight-bearing X-rays after Prolotherapy. It is suggested that before and after X-ray studies can be used to document the response of degenerated joints to Prolotherapy. Future research is needed with a larger patient population and under a more controlled setting to further evidence of clinical responses and cartilage regeneration with Prolotherapy. Callahan J. Arthritis overview. In Lippincott Williams and Wilkins, pub. The Adult Knee. Philadelphia, PA; 2003:465-468. Marwin S. Medial compartment arthritis. eMedicine Specialties. 2008:3-15. Available at: http://www.emedicine.com/orthoped/TOPICS518.HTM. Accessed August, 2009. Dillon CF, et al. Prevalence of knee osteoarthritis in the United States: arthritis data from the Third National Health and Nutrition Examination Survey 1991-1994. J Rheum. 2006;33(11):2271-9. Felson DT, et al. The prevalence of knee osteoarthritis in the elderly. The Framingham Osteoarthritis Study. Arthritis Rheum. 1987;30(3):914-918. Jordan JM, et al. Prevalence of knee symptoms and radiographic and symptomatic knee osteoarthritis in African Americans and Caucasians: The Johnston County Osteoarthritis Project. J Rheum. 2007;34(1):172-180. Felson DT, et al. The incidence and natural history of knee osteoarthritis in the elderly. The Framingham Osteoarthritis Study. Arthritis Rheum. 1995;38(10):1500-1505. Mehrotra C, et al. Trends in total knee replacement surgeries and implications for public health, 1990-2000. Public Health Rep. 2005;120(3):278-282. Koppenheffer M, et al. Joints still volume mainstay, but margin pressures increasing. Executive summary: Future of Orthopedics: strategic forecast for a service line under siege. Health Care Advisory Board, Washington DC. 2003:26-29. Manek NJ, et al. Osteoarthritis: current concepts in diagnosis and management. Am Fam Physician. 2000;61:1795-1804. Kirkley A, et al. A randomized trial of arthroscopy for osteoarthritis of the knee. NEJM. 2008;359:1097-1107. Adams M. An analysis of clinical studies of the use of crosslinked hyaluronan, hylan, in the treatment of osteoarthritis. J Rheum. 1993;20:16-18. Stovitz S, et al. NSAIDs and musculoskeletal treatment. The Physician and Sports Medicine. 2003;31:35-52. Brolinson G, et al. Prolotherapy: Cutting edge therapy for chronic injuries? ACC Sports Sciences Web Site. 2005. Available at: http://www.theacc.com/sports/c-track/spec-rel/061005aac.html. Accessed August 2008. Sheeler R. Alternative treatments: Dealing with chronic pain. Mayo Clinic Health Newsletter. April 2005. Hackett G. Joint stabilization: An experimental, histologic study with comments on the clinical application in ligament proliferation. American Journal of Surgery. 1955;89:968-973. Schwartz R, et al. Prolotherapy: A literature review and retrospective study. Journal of Neurology, Orthopedic Medicine and Surgery. 1991;12:220-223. Hooper R, et al. Case series on chronic whiplash related neck pain treated with intraarticular zygapophysial joint regeneration injection therapy. Pain Physician. 2007;10(2):313-318. Ongley M, et al. A new approach to the treatment of chronic low back pain. Lancet. 1987;2(8551):143-147. Klein R. Proliferant injections for low back pain: histologic changes of injected ligaments and objective measures of lumbar spine mobility before and after treatment. Journal of Neurology, Orthopedic Medicine and Surgery. 1989;10:141-144. Hackett G, et al. Ligament And Tendon Relaxation Treated By Prolotherapy, 5th ed. Oak Park, IL, Gustav A. Hemwall; 1992. Reeves KD, et al. Randomized, prospective double-blind placebo-controlled study of dextrose Prolotherapy for knee osteoarthritis with or without ACL laxity. Alternative Therapies. 2000;6:311-320. Reeves KD, et al. Randomized, prospective, placebo-controlled double-blind study on dextrose prolotherapy for osteoarthritic thumb and finger (dip, pip, and trapeziometacarpal) joints: evidence of clinical efficacy. The Journal of Alternative and Complementary Medicine. 2000;6(4):311-320. Hauser R. Prolotherapy: An Alternative To Knee Surgery. Beulah Land Press, Oak Park, IL, 2004. Center for Disease Control. Report Targeting Arthritis Improving Quality of Life for More Than 46 Million Americans. 2008. Available at: http://www.cdc.gov/nccdphp/publications/aag/arthritis.htm. Accessed August 2008. Lawrence RC, et al. Estimates of the prevalence of arthritis and other rheumatic conditions in the United States. Part II. Arthritis Rheum. 2008;58(1):26-35. Maetzel A, et al. The economic burden associated with osteoarthritis, rheumatoid arthritis, and hypertension: A comparative study. Ann Rheum Dis. 2004;63(4):395-401. Gupta S, et al. The economic burden of disabling hip and knee osteoarthritis from the perspective of individuals living with this condition. Rheumatology. 2005;44(12):1531-1537. Felson DT, et al. The incidence and natural history of knee osteoarthritis in the elderly. The Framingham Osteoarthritis Study. Arth Rheum. 1995;8:1500-1505. Abadie E, et al. Recommendations for the use of new methods to assess the efficacy of disease-modifying drugs in the treatment of osteoarthritis. Osteoarthritis Cartilage. 2004;2:263-268. Altman RD, et al: Total joint replacement of hip or knee as an outcome measure for structure-modifying trials in osteoarthritis. Osteoarthritis Cartilage. 2005;13(1):13-19. Kijowski R, et al. Arthroscopic validation of radiographic grading scales of osteoarthritis of the tibiofemoral joint. American Journal of Roentgenology. 2006;187(3):794-799. Hunter DJ, et al. Imaging outcomes and their role in determining outcomes in osteoarthritis and rheumatoid arthritis. Cur Opin Rheum. 2006;8(2):157-162. Buckland-Wright, JC. Joint space width measures cartilage thickness in osteoarthritis of the knee: High resolution plainfilm and double contrast macroradiographic investigation. Annals of Rheumatic Diseases. 1995;54:263-268. Mazzuca SA, et al. Field test of the reproducibility of automated measurements of medial tiofemoral joint space width derived from standardized knee radiographs. J Rheum. 1999;26(6): 1359-1365. Adam C, et al. The distribution of cartilage thickness within the joints of the lower limb of elderly individuals. J Anat. 1993;(pt2): 203-214. Altman RD. Radiographic assessment of progression in osteoarthritis. Arthritis Rheum. 1987;30(11):1214-1225. American Academy of Orthopedic Surgeons. Report osteoarthritis of the knee: State of the condition. 2004:1-3. Available at: http://www.aaos.org/Research/documents/OAinfo_knee_state.pdf. Accessed September 2008. Boegard T, et al. 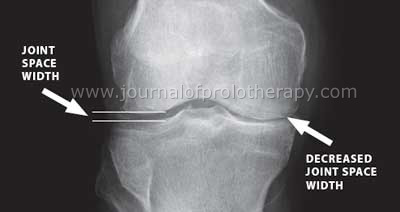 Radiography in osteoarthritis of the knee. Skeletal Radiol. 1999;28(11):605-615. Swagerty DL Jr, et al. Radiographic assessment of osteoarthritis. American Family Physician. 2001;64(2):279-86. Cicuttini F, et al. Choosing the best method for radiological assessment of patellofemoral osteoarthritis. Annals of Rheumatic Diseases. 1996;55(2):34-136. Primack S. Vice Chairman, Oregon Health & Science University, Portland Oregon. Aaron RK, et al. Stimulation of growth factor synthesis by electric and electromagnetic fields. Clin Ortho. 2004;419:30-37. O’Driscoll SW, et al. Experimental patellar resurfacing using periosteal autografts: Reasons for failure. Trans Orthop Res Soc. 1989;14:145. Rae P, et al. Arthroscopic drilling of osteochondral lesions of the knee. J Bone and Joint Surg. 1989;71(3):534. O’Donoghue DH. Treatment of chondral damage to the patella. Am J Sports Med. 1981;9(1):1-10.